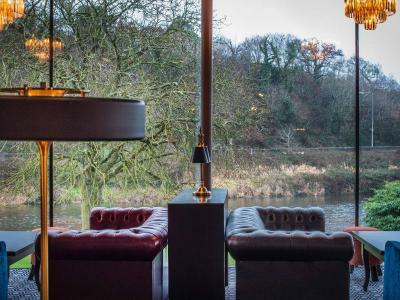 Lock in a great price for The Riverside Park Hotel – rated 8.9 by recent guests! scenery of hotel location and staff 😊 Food was perfect! The staff were amazing, so friendly and made us feel so welcome. The hotel itself is so comfortable, love everything about it. Everything. Great seeing the same staff working there year after year. Friendly, rooms were quiet and clean, good choice of food selections, and the bar/wait staff work incredibly hard to keep the customers happy. Hotel is lovely and clean and all staff are very helpful and friendly food it fabulous especially breakfast. Rooms were just right heat and spacious. 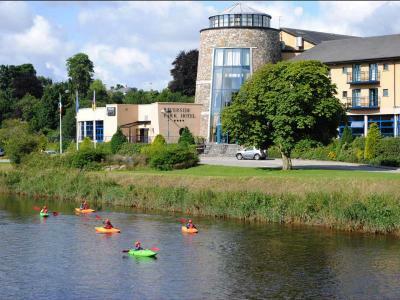 Fantastic hotel located within walking distance of the castle and most of the sites we wanted to see in Enniscorthy! When we checked out this morning the lady at the desk even offered us a bottle of water each for the road and it was much appreciated. Would stay here again in the future for sure. 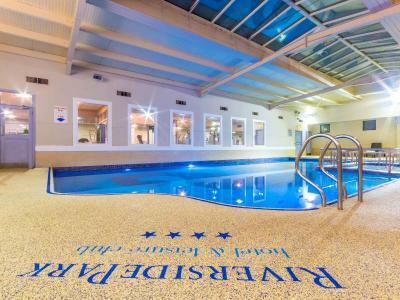 The Riverside Park Hotel This rating is a reflection of how the property compares to the industry standard when it comes to price, facilities and services available. It's based on a self-evaluation by the property. Use this rating to help choose your stay! 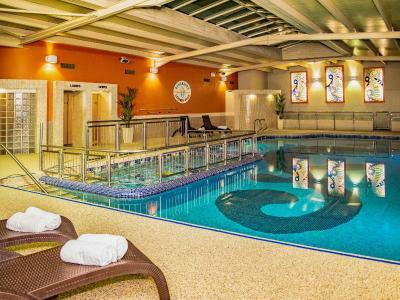 One of our top picks in Enniscorthy.The Riverside Park Hotel and Leisure Club in Enniscorthy town center has luxurious rooms, a gym and a pool. 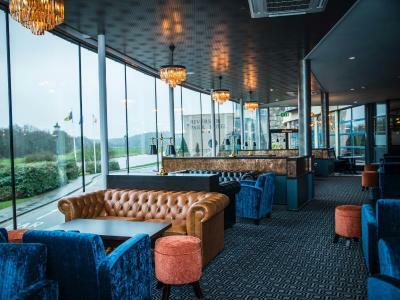 There are 2 restaurants and the bar offers live music and entertainment. 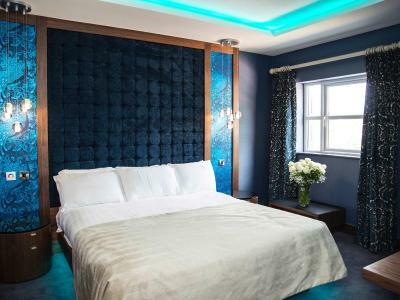 The property contains 100 rooms equipped with hypnosis beds, TVs, ironing facilities and tea/coffee making facilities, free WiFi and 24-hour room service. 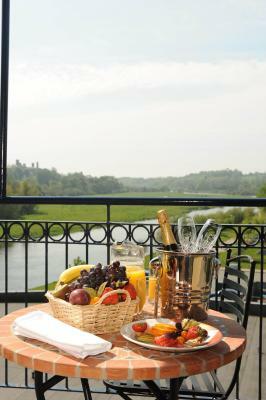 Guests can upgrade to suites and deluxe rooms, or a balcony room overlooking the River Slaney. Family rooms are also available. 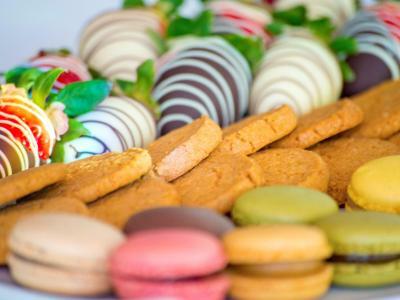 The hotel features 2 restaurants; The Moorings, offering classic cuisine or The Alamo Steakhouse offering a wide variety of dishes. 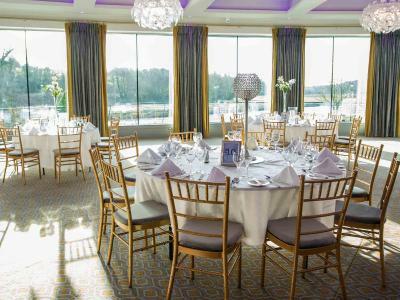 The Prom Bar also serves food and has charming views of the River Slaney and features live music and entertainment. 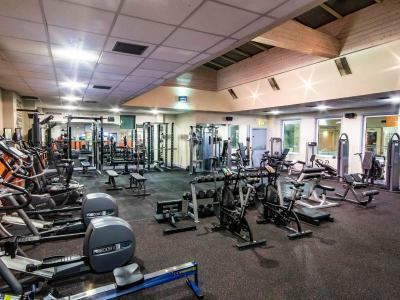 The Riverside Leisure Club is fully-equipped. 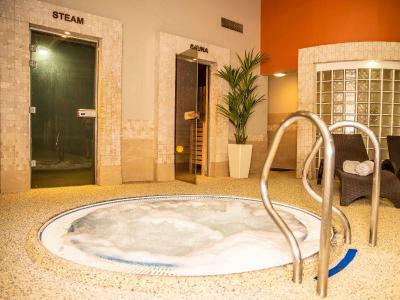 There is a children’s splash pool in addition to the main pool, as well as a sauna, steam room and whirlpool. 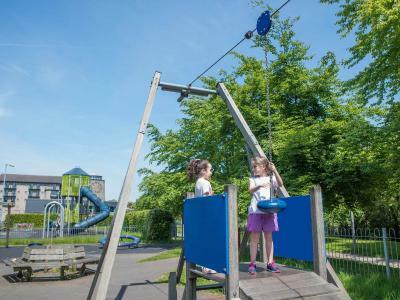 The hotel is family friendly with a Kids Club running throughout the summer, Easter and Halloween school holidays. 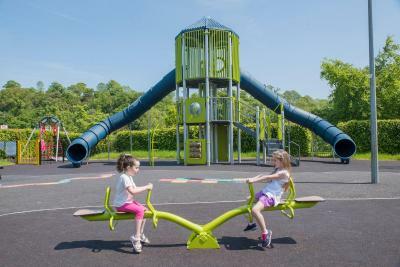 A children's playground is also located adjacent to the hotel and there are several activities available nearby the hotel such as fishing, water sports, quad biking and equestrian activities to name a few. 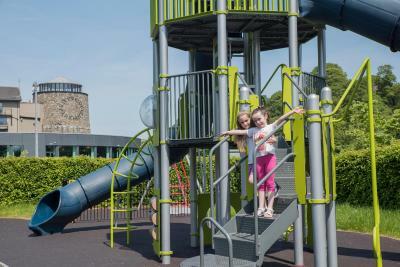 Enniscorthy Castle and the National 1798 Visitors Center, an interactive museum, are both 1,150 feet from Riverside Park. 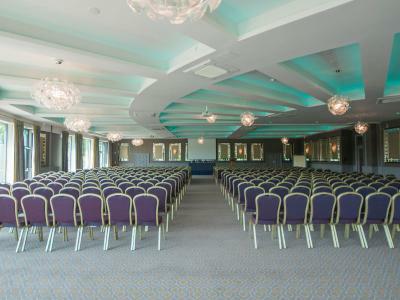 The hotel is 1,800 feet from Enniscorthy Train Station and a 15-minute drive from Wexford Town. 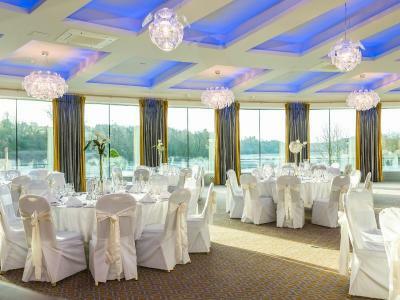 When would you like to stay at The Riverside Park Hotel? Elegant Single Room with a comfortable pillow-top bed and duvet, and crisp cotton sheets. Includes free WiFi, free toiletries, and free mineral water, as well as 24-hour room service and a safe. 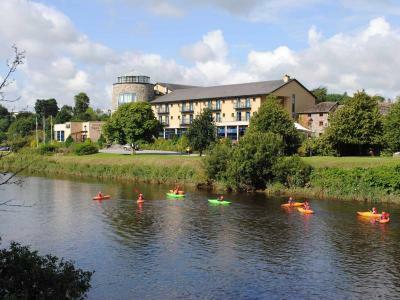 Many rooms have stunning views of the River Slaney (supplement applicable) and all have full use of the leisure club. Family guest rooms consist of of 1 double and 1 single bed (with option of camp bed) or 1 double bed and 1 fold-away double sofa bed accommodating up to 2 adults and 2 children. The rooms have private bathrooms, free toiletries, free WiFi, tea/coffee making facilities, mineral water, an in-room safe and 24-hour room service. Triple rooms feature 1 double bed and 1 single bed. These rooms have private bathrooms, free toiletries, free WiFi, tea/coffee making facilities, mineral water, an in-room safe and 24-hour room service. 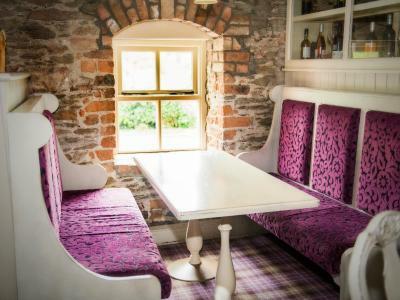 These rooms feature 1 double bed and 1 single bed. This room features a pillow-top bed and duvet, with cotton sheets. The room also includes free WiFi, 24-hour room service, mineral water, and a safe. 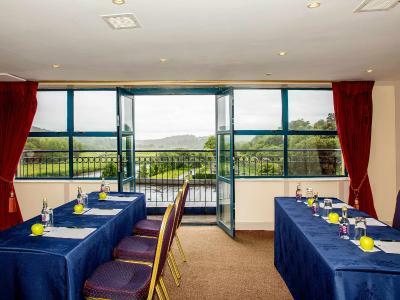 The room comes with views over the River Slaney and full use of the leisure club. The private bathroom has complimentary toiletries. 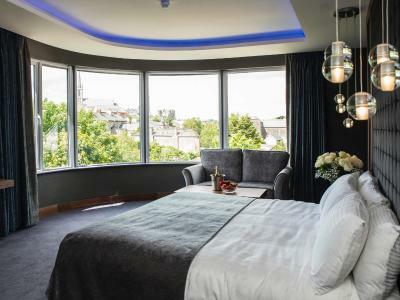 The Junior Suites are individually designed and located on their own private floor with a spacious bedroom/living area. The bathroom is located off the bedroom with a glass shower panel, double shower, bath tub and toilet. Please note that children cannot be accommodated in this suite. The Couples Deluxe are individually designed and the rooms consist of a spacious open plan bedroom with a comfortable couch. The bathroom is located off the bedroom with a hot tub, a glass shower panel, double shower and a separate toilet. These rooms with attached bathroom feature complimentary toiletries, complimentary WiFi, tea/coffee making facilities, mineral water, in room safe and 24-hour room service. 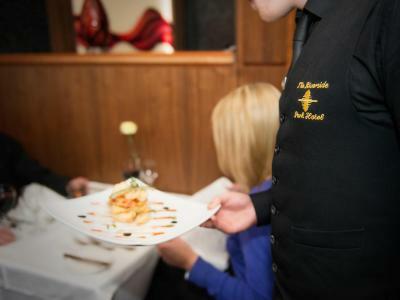 House Rules The Riverside Park Hotel takes special requests – add in the next step! The Riverside Park Hotel accepts these cards and reserves the right to temporarily hold an amount prior to arrival. 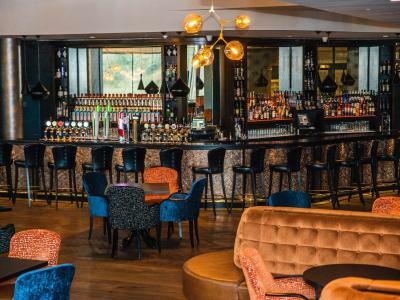 Please note that children under the age of 18 are not allowed in the bar area after 22:00 hour. Please note: rooms may vary in style. The smell from the bathroom even when door was closed. The movement of table and chairs from before 6 am for setting up for breakfast. The staff were extremely helpful and friendly made the stay !! 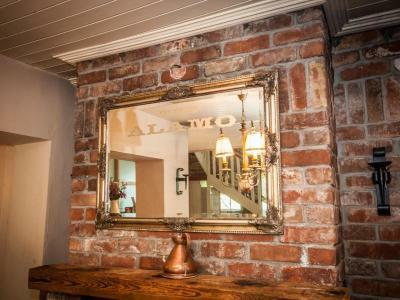 I felt that the family room was far from a superior, it ticked all the right boxes but after booking on website and seeing pictures it just felt the room we were in was just a regular family. Saying that when we went to book in the girl said our superior room wasn’t ready but she’d see if there was a regular one we could have. After deciding to wait till our room was ready I do believe it was a regular one we were give. Especially as the view from our window was of what I presume was the hotel ventilation system, I’d have imagined the view of a superior room would have been a bit more eye catching than this. Exceptional food especially at breakfast, the selection of homemade jams and breads were great and the kids loved the pancake maker and the waffles, the waffles were beautiful, although s bit more variety would have been nice on the bar menu. food wasn't great Alamo restaurant was pricey but food not great. larger tasted a bit off. Very comfortable with lovely staff. As our breakfast wasn't included in our booking so we had to pay extra and as we did not want a cooked breakfast it was quite expensive for what we actually ate - some fruit for me and cereal for my mother, 2 slices of toast and a tea and a coffee for 17 euro. I understand it is the luck of the draw if you don't want to eat too much but it wouldn't encourage me to eat breakfast there for a second day. Great town and the hotel is in the perfect location. We had a room with beautiful river views. 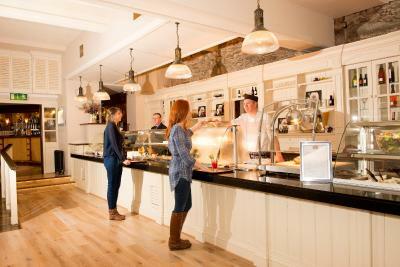 The breakfast was exceptional and the staff really couldn’t do enough for you. A real little gem. Noisy rooms and fire alarm went off 3 times in middle of the night. You need a swim hat to use the pool too. The staff were amazing. So helpful.